Aged Guitar Parts... Bodies and Necks made to exactly match the look and feel of vintage, rare, and hard-to-find guitar parts. 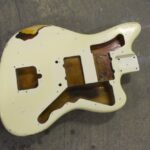 Need guitar bridges, tuners, necks, bodies, pickups, hardware, electronics, for your guitar? Brand new parts, aged to perfection to exactly match the age and wear of your guitar.